Preface: Peter Conrad, Brandeis University Introduction: Susan E. Bell (Bowdoin College) and Anne E. Figert (Loyola University Chicago) "(Bio)Medicalization, Technoscience and Health in a Transnational Perspective: Outlining Old Critiques and New Engagements" PART I: Reimaginings: (Bio)Medicalization and Technoscience in the 21st Century 1. Susan E. Bell (Bowdoin College) and Anne E. Figert (Loyola University Chicago), "Moving Sideways and Forging Ahead: Re-imagining –Izations in the 21st Century" 2. Ellen Annandale (University of York) and Anne Hammarström, "A New Biopolitics of Gender and Health? ‘Gender-specific medicine’ and Pharmaceuticalization" 3. Janet K. Shim, Katherine Weatherford Darling, Sara L. Ackerman, Sandra Soo-Jin Lee, Robert A. Hiatt, (University of California, San Francisco) "Reimagining Race and Ancestry: Biomedicalizing Difference in Post-Genomic Subjects" 4. Commentary and Reflections: Rebecca Herzig (Bates College) "On Stratification and Complexity: Matters of Difference in the Age of Biomedicaliztion" PART II: Pharmaceuticals 5. Jeremy Greene (Johns Hopkins University) "Vital Objects: Essential Drugs and their Critical Legacies" 6. Ari Samsky (Washington University St. Louis) "The Drug Swallowers: Scientific Sovereignty and Pharmaceuticalization in two International Drug Donation Programs" 7. Courtney Cuthbertson, (University of Illinois) "Pharmaceutical Technologies and the Management of Biological Citizens in Chile" 8. 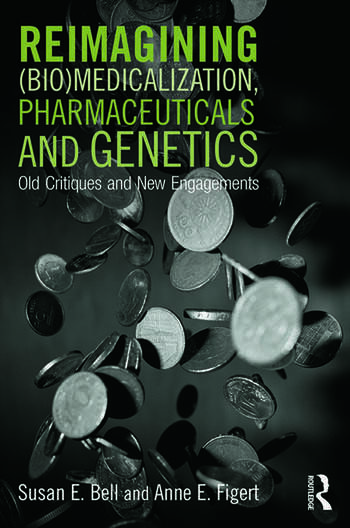 Matthew Archibald, (Colby College) "Essential Medicines, Drug Swallowers, and Biological Citizens: The Ongoing Construction of Pharmaceutical Regimes" PART III: Genetics/Genomics 9. Catherine Bliss (University of California, San Francisco) "Biomedicalization and the New Science of Race" 10. Ruha Benjamin (Princeton University) "Racial Destiny or Dexterity? The Global Circulation of Genomics as an Empowerment Idiom" 11. Sara Shostak (Brandeis University) and Margot Moinester (Harvard University) "Beyond Geneticization: Regimes of Perceptibility and the Social Determinants of Health" 12. Commentary and Reflections: David Hecht (Bowdoin College) "The Lure of the Gene" Epilogue: Susan Reverby (Wellesley College) "Mapping the Bio-medicalized World for Justice"
Susan E. Bell is A. Myrick Freeman Professor of Social Sciences/Professor of Sociology and Chair of the Department of Sociology and Anthropology, Bowdoin College. She is the author of DES Daughters: Embodied Knowledge and the Transformation of Women’s Health Politics (Temple, 2009) and the guest editor with Alan Radley of a special issue of health, "Another Way of Knowing: Art, Disease, and Illness Experience," 2011.